The Victor SPX is the latest member of the Victor Motor Controller product line. This latest iteration is 10% smaller and 25% lighter than the Victor SP, making it the smallest and lightest motor controller in FIRST Robotics Competition history. The Victor SPX is the latest member of the Victor Motor Controller product line. This latest iteration now supports both PWM & CAN while bringing over many of the features from the Talon, including voltage control and closed loop position control. 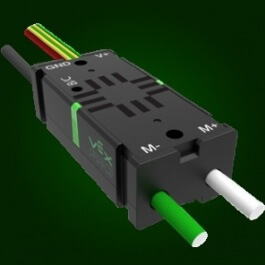 Each Victor SPX comes with male and female 0.1" servo connectors on the ends of the CAN wires, making it easy for FIRST Robotics Competition teams to connect the Victor SPX to the CAN bus network that is already on their robot. Teams that aren't ready to make the jump to CAN bus can use these connectors to connect to the PWM outputs of the roboRIO (female connector). The Victor SPX was co-developed through a collaborative partnership between VEX Robotics and Cross the Road Electronics and is 10% smaller and 25% lighter than the Victor SP, making it the smallest and lightest motor controller in FIRST Robotics Competition history. Click here to learn more about this exciting partnership. Users outside of FRC: Please note that you will need a HERO Development Board to field-upgrade any Victor SPX for use with CAN features. Powers brushed DC motors with variable speed forward, reverse, or off. 2.5" x 1.16" x 0.77"
Download the Phoenix Installer Here!